Cream Jackets first surfaced on Chictopia's streetstyle gallery in Fall 2010 seen on Antwerpen blogger Annebeth of stylingdutchman.blogspot.com. She wore her cream jacket with a red dress, black belt, and black shoes. Since then, Cream Jackets have grown in popularity as bloggers from Smalltown, Withington, and New York have discovered them. Cream Jackets are generally seen in chic, casual, and trendy style. Popular brands of Cream Jackets are Sheinside, Forever 21, H&M, Zara, and vintage. There are currently 215 streetstyle photos of bloggers wearing Cream Jackets. 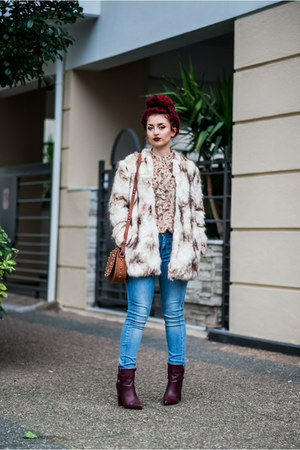 Most recently, blogger districtofchic of districtofchic.com styled her cream Mango shearling jacket with a red Zara ankle boots boots, sky blue 7 for all mankind distressed jeans, and white StyleMint sheer t-shirt.